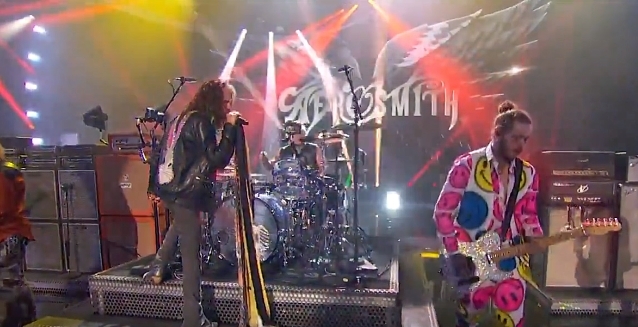 AEROSMITH teamed up with Post Malone to close out the MTV Video Music Awards Monday night (August 20) at Radio City Music Hall in New York City. The 23-year-old rapper performed his hit "Rockstar", flanked by recent tourmate 21 Savage, before introducing AEROSMITH. Malone picked up a guitar and played along as AEROSMITH launched into its classic song "Dream On", then broke into "Toys In The Attic". AEROSMITH's VMA performance served as promotion for the band's upcoming "Deuces Are Wild" Las Vegas residency, which kicks off April 6, 2019 at Park MGM's Park Theatre. The residency, promoted by Live Nation and MGM Resorts International, features "never-seen-before visuals and audio from AEROSMITH recording sessions" via producer Giles Martin, who crafted the sound for THE BEATLES' "Love" Cirque Du Soleil show in Vegas. The band has also teamed with THX and L-Acoustics, who will deliver "the world’s first THX Certified live performance presented in L-ISA Immersive Hyperreal Sound." The band's 18 Vegas shows will run between April 6 and July 9. General tickets, starting at $75, go on sale on Friday, August 24 at 10 a.m.